When it’s late at night on a lonely road and your fuel gauge starts flirting with the Big E, it’s gut check time. First you enter Fuel Preservation Mode and start accelerating really slowly and coasting nonchalantly through Stop signs to save your precious, remaining fumes. Next maybe you fall into a bit of a Blame Game, wondering why you let yourself get to this terrible place and pledging to never to do it again. After that it’s time for Survival Mode, where you make a mental checklist of all the emergency food and supplies you have in the car, imagining yourself building a Kleenex blanket to keep warm and eating restaurant mints and ketchup packets to survive. And then finally, when hope is almost lost, with that fuel light burning brightly, that steering wheel gripped tightly, and those hands shaking slightly, you drive up another dark, lonely hill and finally notice some blissful, heaven-sent gas station lights appearing just over the horizon. The worst is 9pm in West Virginia. There are gas stations, but they are all closed, and they don’t have a way to use your credit card at the pump. No awesomeness there. We ran out of gas. We’ll never make that mistake again. I’ve run out of gas a number of times. It’s fun, actually. When your car stalls, are you facing up a hill or down a hill? If down a hill, how far is the nearest gas station? I try to put gas in the car when it’s at a quarter-tank to avoid such issues. But still, Carolyn, gas stations close at 9pm in W.Va.? In the wonderful state of Ohio, every gas station I can think of (in the capital at least) is open all night. I can tell you with some certainty that there a few gas stations open way past 9pm in the Northern Panhandle of West Virginia. I gassed up at one in Weirton, WV, when I was back home at Thanksgiving. But yes, the essence of the empty gas tank is captured in this post. Truly. Hi! Thank you for this post. Actually, I’m not very familiar with this topic but after reading your post, it’s clear now! Keep up the good posts like this. Take care! Read my mind. The exact same thing happened to me just today on my return trip from south Arkansas. I made a turn on one of the roads that signals the halfway point and my gas light comes on. I know it is about ten minutes later to the nearest gas station (or Boot Station as we call it). As it nears crunch time I see the gas station in sight and pull in, only to find that it is closed and the pumps do not take plastic. Now we’re in full survival mode. A/C off. Radio off. Next town is 15 miles away, definitely too far to make it on fumes. Luckily, however, the savior RGS (Random Gas Station) appeared maybe five or six miles down the road and provided me with much needed fuel. I think I have more just ketchup packets in my truck, maybe a petrified candy bar or a nice dead lizard from a hiking expodition. During a Christmas party at work two years ago, we had a snow storm, the party got out pretty late, and I remembered my gas light was on. I was thinking about my options as I slipped on the icy road. 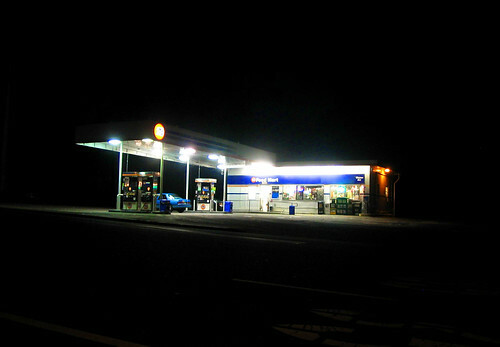 But then I see it, the Shell Station light. I was thanking the Flying Spaghetti Monster the whole way home. A Driving schools based in Milton Keynes supplies driving lessons from £15 by DSA approved driving instructors! It was 1978 and I was 7 months pregnant. Went on a “vacation”, took a wrong turn and we were lost on the Hurley Pass logging road, in Grizzly territory and very rough terrain. The truck was up to the floor boards in mud, the fuel can got a hole which ate up the styrofoam cooler that held all the food that could have helped us out and leaked all over the clean clothing; black deer flies were attacking. Certain my baby would be born from panick, we were going to die there, and baby would be raised by wolfes, I went into hysterics. some sense had to be slapped into me. Then, Thank God, someone else got lost, with fuel and pulley. Lead us to the Goldbridge service station who would not have a delivery for 3 more days, but we were at least as close to civilization as in get’s in them there parts you don’t really wan tot close your eyes on! The holiday from Shell-the S!